Common DVD ripping is bogged down to various errors like no valid source found, halfway crash, audio and video disorder, etc. This is down to the various copy protection schemes meant to thwart the rippers. This guide shares the best DVD decrypter for Mac users to circumvent various DRMs and rip any DVDs without a hassle. "Has anyone successfully ripped protected DVD movies from Disney ever? I tried Ripit but it hung up after saying 100%. MTR couldn't recognize the disk. Then I went with handbrake, it created the movie but it jumped around from different chapters. Toast even prompted as large as 75gb file size while backing up DVD disc. Are there any DVD decrypter that really works? I'm running on El Capitan, any recommendation of DVD decryption tool for Mac will be appreciated." When you have a DVD, you may want to rip it for safe backup or playback on phone or tablet. Ripping DVD is simple, but the DVD copy protection put in place on most commercial DVDs makes the process complicated. So it is no surprise that users' demand for decrypting protected DVDs continue to be strong. No worries, a good DVD decrypter for Mac will circumvent the disc's Content Scrambling System (CSS) code or other schemes and rip encrypted DVD on Mac without a hassle. Below we list a few Mac DVD encryption removal tools that will 100% decrypt/rip protected DVDs on Mac (MacBook Air/Pro/iMac). 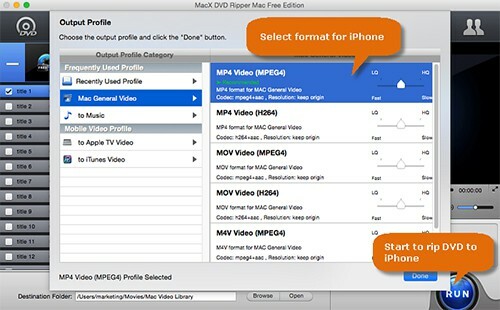 MacX DVD Ripper Pro is a professional DVD decrypter for Mac (Mojave supported) and Windows (10) that can rip any encrypted DVDs from Disney, Paramount, 20th Century Fox, Universal, Warner Bros etc, whether that are encoded with DVD CSS, region code, RCE, Sony ArccOS, UOPs, or Disney X-project protection, etc. This Mac DVD DRM removal software will easily rip protected DVD on Mac (MacBook Air/Pro/iMac) to popular video formats or mobiles with it. * Decrypt DVD on Mac with copy protections like CSS, RCE, APS, UOPs, etc. * Copy encrypted DVD movies to ISO image, MKV, MPEG2 at 1:1 ratio. * Rip protected DVDs to MP4, AVI, 3GP, MOV, FLV etc, or to iPhone, iPad Pro/Air/mini, Samsung Galaxy, etc. * Support the latest macOS Mojave and Windows 10, with 36x faster speed and original quality. Step 1: Free download DVD decrypting software on Mac and run it. Click "DVD Disc" to load disc from the drive. Or you can click "DVD Path" to import DVD folder or ISO image saved on your computer. Step 2: Choose the output format or device from the drop-down window. Step 3: Click the "Browse" button to set the destination for the output video. Step 4: Tap "RUN" button and this DVD decrypter for Mac will start to rip Lionsgate DVD, Disney DRM-ed DVD, Sony protected DVD, CPRM DVD, or the latest released DVDs like Venom. Note: if you have any trouble ripping Sony DVDs, Disney protected DVD, Lionsgate DVD, etc, just choose Safe Mode on the interface and it will work like a charm. Handbrake is surely another program you are not unfamiliar with. This best DVD ripping software is renowned for its open source and straightforward interface, working perfectly in ripping DVD on Windows, Linux, and Macintosh operating systems with ease. It's able to rip DVD to popular formats and devices like iPhone iPad Android. 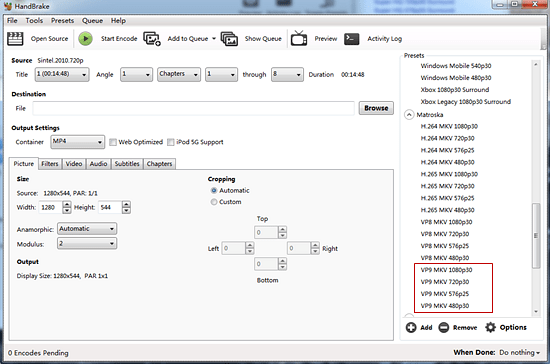 However, not a few of users are complaining that Handbrake won't rip DVD with copy protection. In fact, Handbrake requires libdvdcss to decrypt CSS protected DVDs. But as for other DVD encryption tech, you need the help from third-party DVD decrypters to crack the protection mechanism if you insist on DVD ripping with Handbrake. 1. Download and install the latest version of HandBrake and libdvdcss-2.dll for Handbrake on Mac. 2. Insert the DVD you want to rip, and open Handbrake. 3. Click the Browse button to set where you want to save your movie file. 4. Click "Presets" to choose what format or device preset. Note: For users with El Capitan or newer version, they may run into Handbrake errors with libdvdcss as a result of the new security system - "System Integrity Protection", which removes libdvdcss. In this case, you may try to reinstall the Handbrake libdvdcss.pkg. Check the full solution to HandBrake Libdvdcss errors. MakeMKV stands as a good free DVD decrypter for Mac OS X (El Capitan) as it can convert various multimedia, including Blu-ray and DVD discs. It's on the list of best Mac DVD ripping software for that it can rip DVDs and Blu-ray discs protected with latest versions of AACS and BD+. This Mac DVD decrypting freeware is fast, super easy and strong, but it can output MKV only, which means you will get a DVD rip comes in at 15GB and a Blu-Ray rip at 30GB easily. Besides, many users have encountered "ILLEGAL REQUEST:COPY PROTECTION KEY EXCHANGE FAILURE" error for that some latest copy protections are not supported. 1. Insert DVD or bluray disc and open up MakeMKV. 2. The DVD ripper freeware will remove the copy protection. 3. Choose the parts you want to copy from the popping-up window. All of the boxes are checked by default, which means it will rip encrypted DVD on Mac into a single MKV file that will include everything on the disk including trailers, multiple subtitles etc. 4. 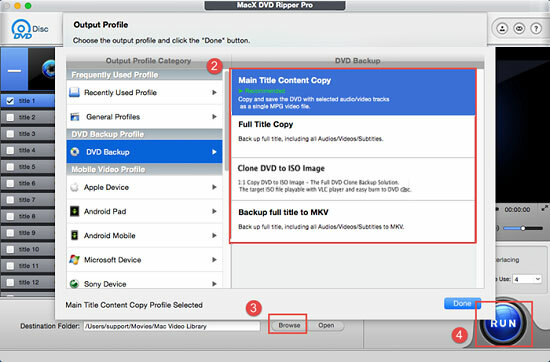 Set a place to save the output MKV file and click Yes to start the DVD decrpyting on Mac. Suggested by its name, MacX DVD Ripper Mac Free is a free DVD decrypter for Mac (MacBook Air/Pro/iMac etc). This DVD decrypter Mac OS X freeware is 100% free yet powerful to rip and decrypt protected DVDs on Mac (Mojave incl.) by removing the widely-used copy protections like CSS encryption, Sony ARccOS, region protection, UOPs, APS, Disney movies copy protection. It supports DVD decrypting free to MOV, MP4, M4V, iTunes, Apple TV video for iPhone, iPad, Apple TV 4, etc. Step 1: Click "DVD Disc" to load disc from the drive. Or you can click "DVD Path" to import DVD folder or ISO image saved on your computer. Step 4: Tap "RUN" button and start the ripping process. After the DVD decrypting, you can sync the converted movies to iPhone iPad with MacX MediaTrans. Note: This DVD DRM removal freeware comes with limited output formats and devices profiles, as well as limited support for latest copy protections, so you may need to upgrade to the advanced DVD ripper decrypter for Mac. Any DVD Cloner Platinum for Mac is a powerful DVD decrypter Mac users can use. It can rip DVD to DVD, DVD folder, ISO, or to MP4, MKV, M4V etc or iPhone 6S/6S Plus, iPad Air 2/mini 4, Samsung Galaxy S6 etc. It will decrypt DVD on Mac with various copy protections like CSS, RC, RCE, APS, UOPs, ARccOS, etc. It's a powerful Mac DVD backup and cloner, but it won't work on the latest Mac OS X El Capitan. 1. Click DVD ripper decrypter Mac and select output format or output devices. 2. Select the audio track and subtitle. 3. Click Title Start/End Setting button to choose the titles and chapters you want to rip. You may click More Settings button to adjust video & audio parameters, frame size etc. 4. Start to rip protected DVD on Mac. Note: you can clone DVD to DVD disc, backup DVD movie to Mac's hard drive with it. Note: The software developer calls for decrypting or ripping DVD under the concept of Fair Use and does not encourage any illegal reproduction or distribution of copyrighted content. Please abide by the local DVD copyright law before doing it. 3-in-1 DVD decrypter, copier and ripper to backup and rip any DVDs on Mac and PC.